I happen to live in a place where Mardi Gras lasts a lot longer than it should. No, I don’t live in New Orleans, or even Rio. I live in Orlando, and thanks to Universal Studios Theme Park, I hear about Mardi Gras looooonnnnngggg into the Lenten Season. But I digress. I happen to love the tradition of the King Cake. Do you know about this? A king cake is a brioche-style cake, which may or may not have a filling, that’s traditionally baked in a ring, and decorated with a glaze and the colors of Mardi Gras: yellow, purple, and green. Another fun part of the tradition? There is usually a small baby figurine (representing infant Jesus) baked inside, and if you get the slice with the baby, you have certain rights and privileges. So…I’m gonna take a guess, and assume that this groom is a Louisiana Boy! 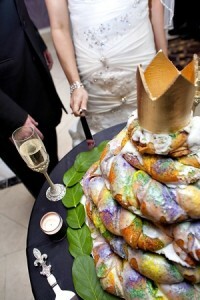 I love LOVE this tiered king cake as groom’s cake, complete with a crown topper! It makes me want to head right into the kitchen and whip up this treat, which we normally enjoy just before Lent begins. Wouldn’t you love a slice, too? I found this terrific pic on Pinterest. Unfortunately, I don’t know who baked it…but I had to share anyway. It was just too fun to pass up! Do you know who put together this fabulous tiered king cake? Please leave us a comment below!